Omaha Poker is a form of Texas Hold’em Poker. The main difference however is each player is dealt 4 hole cards instead of 2. 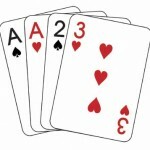 To start each hand, the dealer shuffles a standard deck of 52 cards, then deals 4 cards face down to each player. The small and big blind (located directly to the left of the dealer) are required to put in money before any action has taken place. The small blind must put in half of what the big blind puts in. Then the action goes clockwise, starting with the player to the left of the big blind. Each player can either call the big blind, raise of fold. Then the flop is dealt, which is 3 community cards placed face up in the middle of the table for players to use to improve their hands. Another round of betting then takes place. Another card is dealt face up called the turn. Again, a round of betting occurs immediately after. Then the final community card is dealt, called the river. The last round of betting takes place and then the cards are turned over. Each player must use 2 of their 4 hole cards and 3 of the community cards to make their hand. * You must use 2 of your hole cards and 3 of the community cards. This means a if you have the 1 heart in your hole card and 4 hearts appear from the community cards, this does not mean you have a flush. Full Tilt Poker is the home of the best Omaha Poker action that you will ever find. This is also a great place to learn the rules of Omaha Poker by playing in free money mode. Once you are ready to make a deposit and start playing for real money the FullTilt Poker referral code EASYTILT will give you a $600 bonus on your first deposit.